• Variety: Kristen Stewart is in talks to join the TriStar pic “Billy Lynn’s Long Halftime Walk” directed by Ang Lee. The cast includes Joe Alwyn as the title character and Garrett Hedlund. 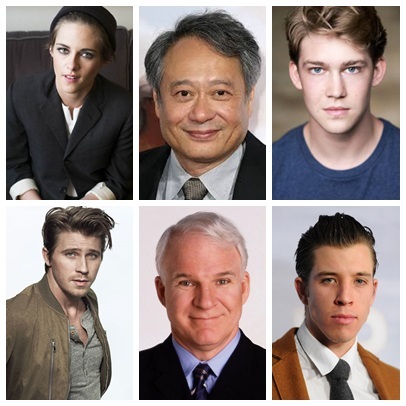 Based on the Ben Fountain novel, “Billy Lynn” will be co-financed by Jeff Robinov’s Fosun-backed Studio 8, together with Chinese distribution company Bona Film Group. Sony Pictures is handling worldwide distribution except for China, where Bona Film will release the film. Most of the movie takes place during a Thanksgiving Day football game. Bravo Company and 19-year-old private Billy Lynn are part of the spectacular halftime show, as part of a promotional tour arranged by the U.S. government. The team’s heroic work in Iraq had become internationally known when captured by news cameras, and the film features flashbacks to the underlying events and the heroism of Lynn, who is facing an imminent return to the war. Lee, who won a directing Oscar for his innovative work on “The Life of Pi,” will be using new technological and artistic methods in “Billy.” These include use of the Sony F65 camera shooting in native 3D, high resolution, and with an ultra-high frame rate to create a different cinematic syntax in service of the story. He wants to give audiences a better sense of the heightened sensation that soldiers feel on the battlefield and on the home front. Kristen Stewart is in negotiations to join Ang Lee‘s “Billy Lynn’s Long Halftime Walk,” an individual with knowledge of the project told TheWrap. Stewart is lining up the role of Kathryn, Billy’s older sister. • Backstage: A young private is brought home for a promotional tour after a battle he's involved with in Iraq is caught on camera. With Joe Alwyn, Garrett Hedlund, Beau Knapp, and Steve Martin. Produced by TriStar Productions, Bona Film Group, Ink Factory. Shoots April 15–June 15 in Atlanta and the Middle East.